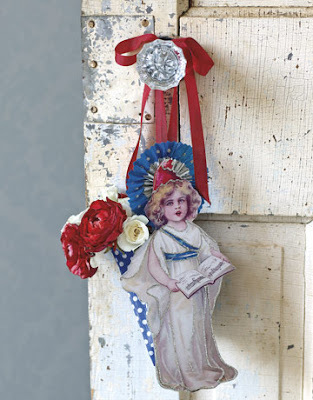 I don't know about you, but one of my favorite holidays to decorate for is the 4Th of July! Here are some fabulous ideas from Country Living that will make your home very festive! 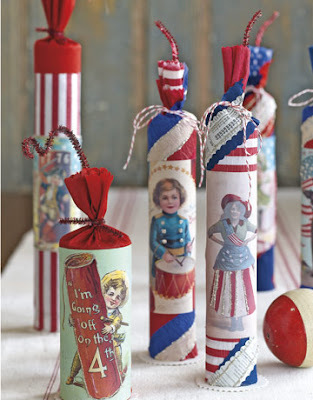 to make these darling firecracker favors: Wrap paper towel tubes with crepe paper; add favor, then hot-glue a cardboard circle to the tube's bottom. Insert a pipe cleaner "wick"; tie off. Click here for the Victorian postcard images. STEP 1 From blue crepe paper, cut a strip 8 inches wide and 20 inches long. STEP 2 From a clean newspaper, cut a narrower strip of paper. Lay it down in the center of the blue strip, gluing in place. Repeat, cutting an even narrower strip of red crepe paper, then gluing in place. STEP 3 Fan-fold across the narrow width of the strip. Fold in half lengthwise. STEP 4 Open out on either side of the center fold you just made to create a circle; glue. 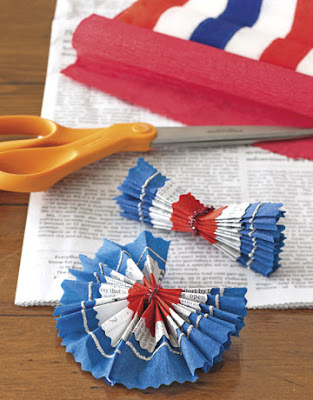 Print "Happy Fourth"; cut out around the letters in a circle with pinking shears. Glue onto rosettes. STEP 5 Cut 8-inch pipe cleaners in half. Use one to form a loop; slip through another to form another loop, and so on. When chain is complete, glue a pipe cleaner loop to the back of each rosette, first passing it through a chain loop, then gluing in place. 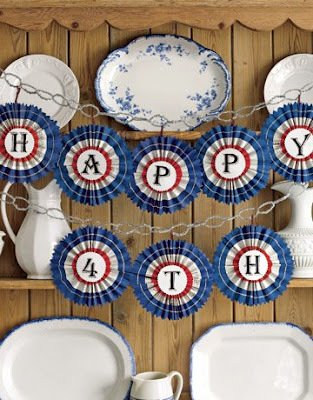 Click here for printable instructions on this Happy Fourth banner! 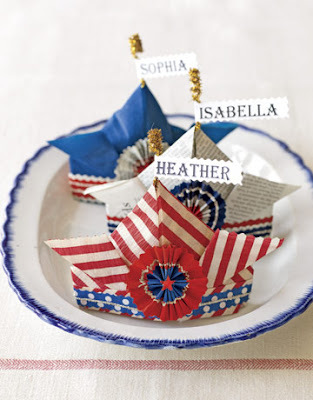 Click here for instructions on how to make these Patriotic Place cards. 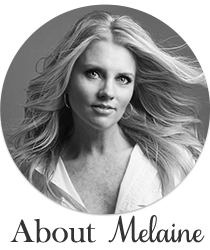 you have the loveliest blog! just popped over from kelly's (rose vine cottage) and am in awe! I love these. I will definitely be visiting the website for the instructions. Thanks for the information. Oh my those are adorable. I will be heading to a craft store tomorrow. These are all super darling! Wonderful! I love the banner. Thank you for the instructions. I can't wait to make it and hang it in my entry. I was on your Etsy site yesterday because I was looking for July 4th decorations. Yours are very cute. Then what do I find today? Your blog. And I didn't even come through your Etsy site. I was visiting DaisyPinkCupcake. I also see that you beat me to the July 4th postings I started yesterday. Ha ha. Great minds, right?